Ebay Seller At it again! incorrectly sized tires, and incorrect carpet (obviously aftermarket replacement). Anything else you guys see? Wow, you are good! I almost missed the gauge, I had no idea about the carpet, looked original to me. Could it be a flood damage car? I dunno, why else would someone replace ALL carpet? I guess it could get quite moldy and hazardous if the car was stored in a damp and dark area. Look at the ash tray, it was a smokers car. I'd love to see one of these in person. This looks like a classic, buy at auction cheap, buff, sell as mint used car deal. I say flood. The cargo nets look like they have been dried after sitting in muddy water. Funny about the net. I was thinking the spare tire well looked awefully dirty. Also I think it is still the original carpet, just died. Its to light to be brown and to dark to be palamino. Why no pics of the storage/3rd row seat? You would think he would at least put new headlights in that wagon. Is that minnows I see swimming in the bottom of those?? didn't this guy have an sdl on awhile back,if so they both look like they have earl schieb paint jobs.they might shine but have no clarity as an original mb paint job. You would think he would at least put new headlights in that wagon.Is that minnows I see swimming in the bottom of those?? Holy crap, you're not kidding!!! Is that really a few inches of water in the bottom of the headlights? There's clearly a lot of condensation in the right one. I was thinking the spare tire well looked awefully dirty. Looks like it was submerged for a good while. Last edited by darkmoebius; 07-22-2006 at 08:32 PM. Them's Killyfish,brought up from the gulf courtesy of the NOLA flood I'll betcha. What are you seeing in the gauge that I cannot? It looks like the gauge in my 1985 sedan. It looks like the gauge in my 1985 sedan. Look closely at the center 'buttons' (pivot points for speedo and tach needles). The speedo and tach both have black buttons. The center button on the left gauge is chrome. '82 was the last year I think with chrome buttons. Go look at your '85. The left gauge group should have a black button. You're good! The seller's car has a gauge in which all three needles come out from a common center with a chrome button. My '85 has three separate little gauges with black buttons as pivot points. Incidentally, the seller's photo is titled "2004_Hyundai_42k_185.jpg." 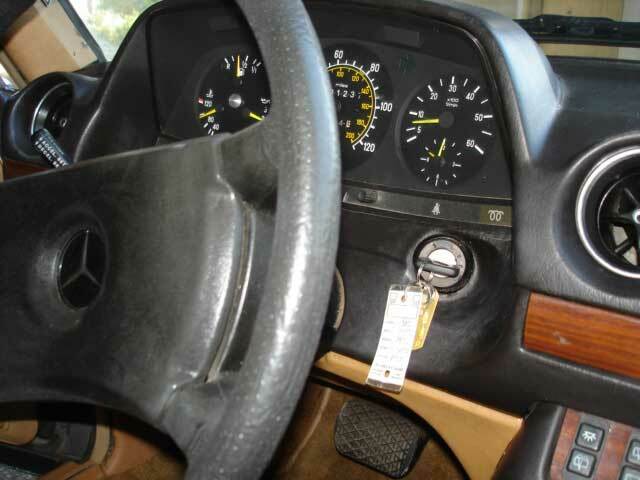 I replaced the gauge in my '85 with a chrome buttoned gauge from an earlier model just like this guy did. My reason is because the oil gauge was leaking on the original gauge and I found the other one at a junk yard for $12. No, the sellers car has three gauges with black pivot points, just like yours. The 'phony' center button is chrome, where the later style has no phony center button at all.